Meet Christy Anderson, the new Indigenous Graduate Student Success coordinator. 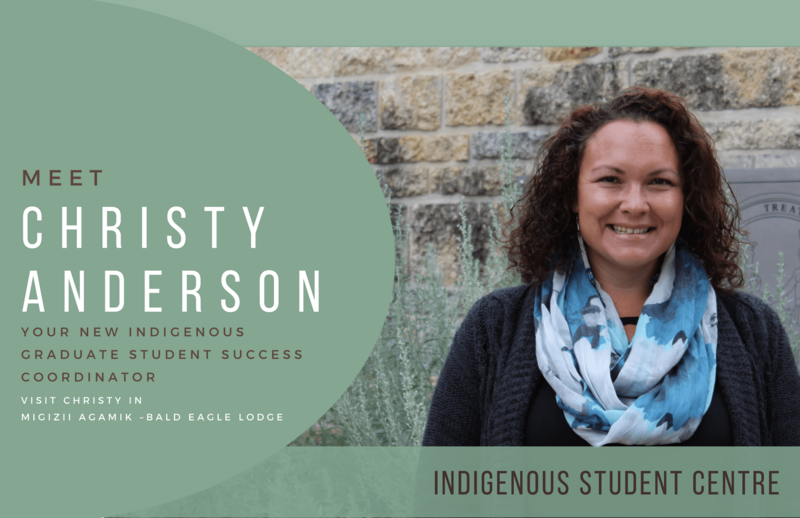 Stop by Migizii Agamik (Bald Eagle Lodge) at the Fort Garry campus to meet Christy and learn more about her role in supporting Indigenous grad students on campus, or email her at christy.anderson@umanitoba.ca. If you are an Indigenous graduate student, make sure you take the time to stop by the Indigenous Student Centre at the Fort Garry Campus. The Indigenous Student Centre (ISC), a unit within Indigenous Engagement, is responsible for welcoming and supporting Indigenous students, as well as providing opportunities for students to learn about First Nations, Inuit and Métis culture. The Indigenous Graduate Student Success Coordinator provides supports, resources, and peer networking opportunities to Indigenous graduate students. Vision: The University of Manitoba is recognized as a sacred space where every Indigenous student is empowered with the resources needed to achieve academic success and cultural and spiritual wellbeing so that they can grow as leaders in their communities and fields of study. Mission: The Indigenous Student Centre (ISC) provides holistic supports, services and opportunities so that students will feel a sense of belonging, be affirmed in their identities, have meaningful experiences and achieve authentic success. The ISC creates opportunities for students, staff, faculty and the wider community to learn about, celebrate and honour Indigenous cultures, knowledge, languages and ways of being. Values: The ISC has adopted Guiding Principles based on the Seven Sacred Teachings as our core values. They guide the process of engagement for all members of the ISC as they work to serve the students and the community of the University of Manitoba as well as the larger community. For more about the resources offered by the ISC, visit the Indigenous Student Centre website. The UMGSA formed the Indigenous Ad-Hoc Committee in 2017 to work towards improving the Indigenous graduate student experience on campus. To join the Indigenous Ad-Hoc Committee, or for more information, contact our Senator Laura Forsythe at senator2@umgsa.org.